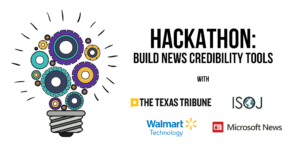 Developers, designers, researchers, news junkies, journalists, academics and others in the Austin area will come together in April for a hackathon focused on building news credibility tools. The free event — which will take place on Thursday, April 11 from 9 a.m. to 6 p.m. at Studio 919 at the Texas Tribune — is organized by the Texas Tribune and the Knight Center for Journalism in the Americas, and sponsored by Microsoft News and Walmart Technology. Registration is now closed for the event, which will be held the day before the 20th annual International Symposium on Online Journalism. During the hackathon, attendees will form three- to five-person multidisciplinary teams to tackle building tools to measure and boost trust in news. Participants are welcome to bring their own ideas, but it’s not necessary. At the end of the day, they’ll present their tools or concepts to a panel of judges who will award a prize. ISOJ 2019 is a global conference on the state of online journalism, which will take place April 12-13 at the Blanton Museum of Art at the University of Texas at Austin. The event attracts journalists, media executives and scholars from around the world. Founded in 1999 by UT journalism professor Rosental Alves, the conference celebrates its 20th anniversary this year.